In this episode of street sign language lesson, we will see a number of interesting food choices, final rebates, pesky body-part pluralization, and information about how to keep your hands clean in the hospital. Oh, make it stop. Words around Bergamo. Left: A package sender. Center left: A type of tripe. Center right: Cartilage. Right: Leave the toilet clean sign. 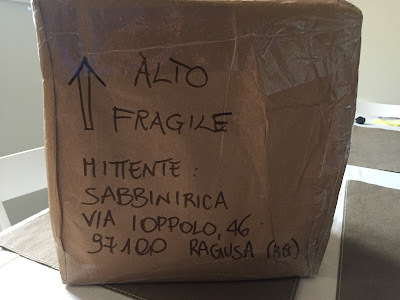 When we received this package, I realized I had never seen “sender” written in Italian, on a package. So, there you have it: mittente. For these two signs we go back to our favorite butcher (Macelleria Coffetti on via Masone) and favorite cheese shop (Ol Formager on via San Tomaso) to peruse the offerings. Omasum is the third compartment of the stomach of ruminants, in this case cow stomach. 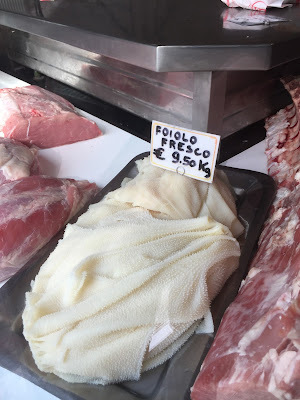 It’s a type of tripe. Cartilage would be pig cartilage and it makes a lovely salad…they say. Have yet to try it, but would like to. 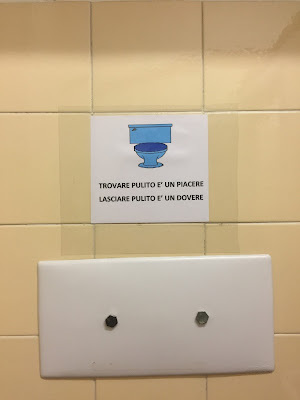 Trovare pulito è un piacere; lasciare pulito è un dovere – Finding it clean is a pleasure; leaving it clean is a must. 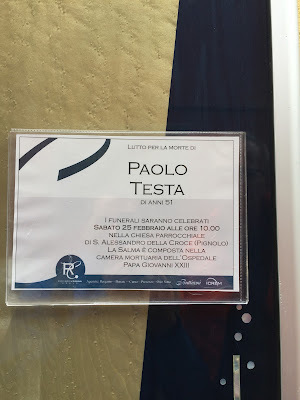 This was sign was in the Biblioteca Angela Mai in Città Alta. "It" is the toilet. This library is the best place to study, and the toilet is reasonably clean thanks to this sign. 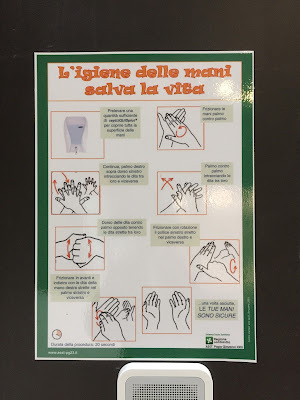 Papa Giovanni XXIII signs instructing on how to clean your hands. 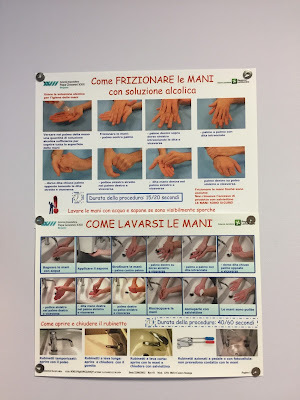 Recently we had occasion to be in the main hospital in Bergamo (Ospedale Papa Giovanni XXIII) for several days in a row. 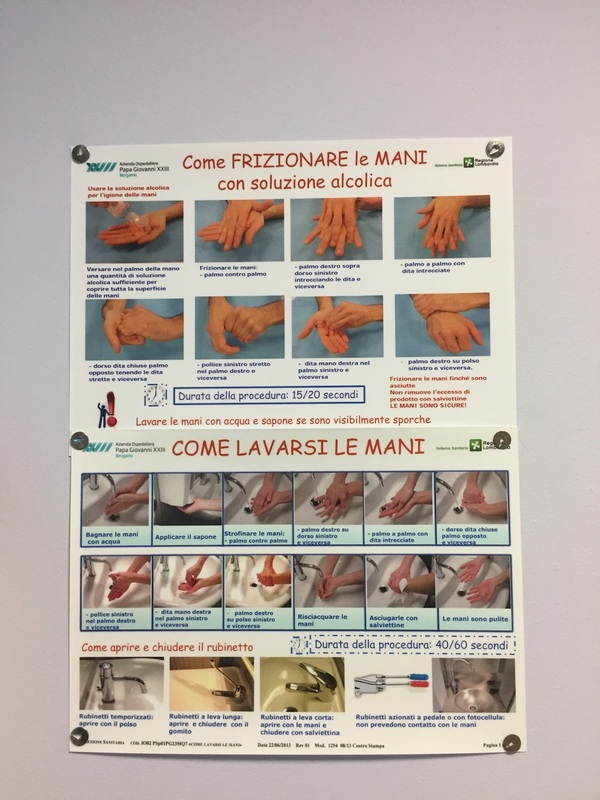 There are a thousand and one signs dealing with how to correctly clean your hands. Hands (la mano, le mani) is one of the body-part nouns that is unusual. Usually, nouns ending in “o” and plural ending in “i” are masculine, but not in this case. 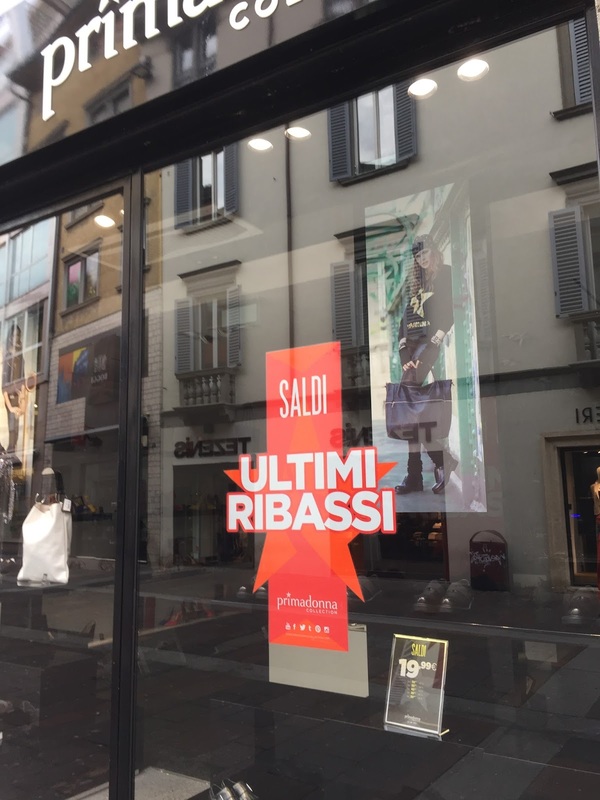 Signs around Bergamo: Left: mourning. Center left: stracchino cheese. Center right: eyelash and eyebrow work. Right: Final rebates. Lutto (mourning) is not to be confused with lotto (game of fortune), though some might see some connection between the two. This sign was posted on via Pignolo outside the apartment of the deceased. Public death notices are common in Italy. In many small towns, there are almost always public bulletin boards containing death notices. Another “interesting” word in this sign is the word for corpse or body, la salma. In this case, the body is at Ospedale Papa Giovanni XXIII - like I said, everything happens there. How’s that for a translation? Lo stracchino is a type of cheese common in Lombardy. 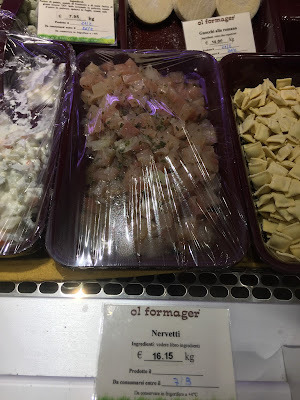 The guy at our favorite cheese shop (Ol Formager on via San Tomaso) said that it’s basically taleggio (it’s internationally famous cousin) without all the fancy branding. 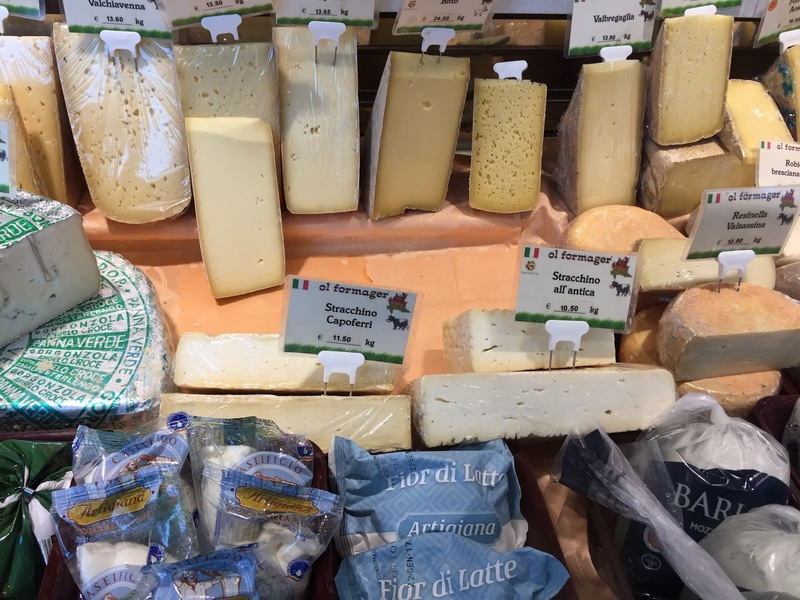 The word stracchino derives from dialect meaning tired (in Italian: stanche) owing to the fact that the cheese is made from cows coming down from high summer pastures. The cows at that time produce less milk, but with qualities that make this cheese taste so darn good. Want the perfect look? 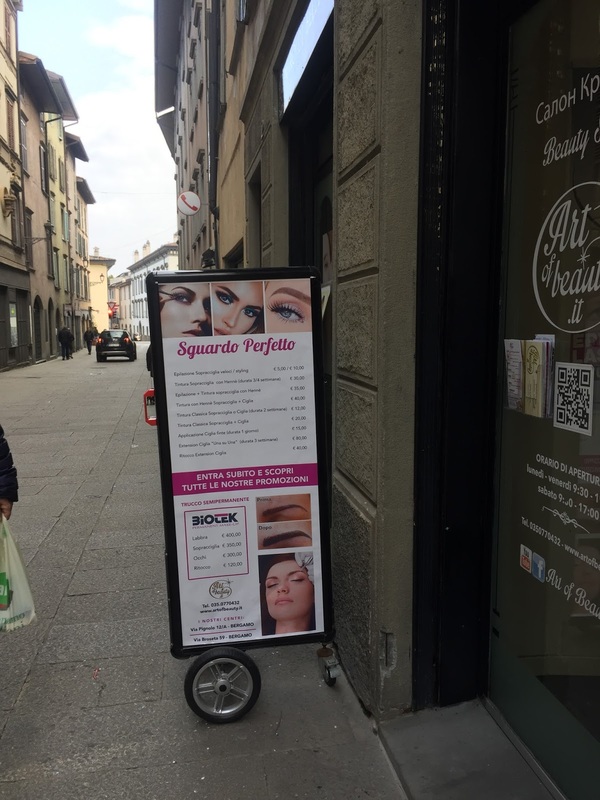 Go to this salon on via Pignolo where you can get work done on your eyelashes (ciglia) and eyebrows (sopracciglia). Eyelashes and eyebrows are another body part that doesn’t follow the standard male-female gender rules. These words change gender when plural: eyelash (il ciglio), eyelashes (le ciglia), eyebrow (il sopracciglio), and eyebrows (le sopracciglia). That said, ciglio, when used in other senses is pluralized as expected. For example, i cigli della strada is the “sides of the road”. And, you will see sopracciglio pluralized as expected when referring to the eyebrows collectively as in entrambi ai sopraccigli or “between the eyebrows”. Ultimo has a number of senses, here I think it means less “recent” and more “final”. Signs warning you about slippery stairs and entering the hospital with your face covered. Per motivi di sicurezza usufruire delle scale interne – "for security reasons, use the internal stairs"
This sign was at the recently completed University of Bergamo building on via Pignolo. It had just snowed a little and as pretty as the new external stairs were, they were too slippery to walk on. I like the verb usufruire: in its basic sense it means “use”, but in its more elegant sense it means “to avail yourself of”. Per ragioni di sicurezza è vietato l’ingresso con volto coperto – For security reasons, it is forbidden to enter with your face covered. 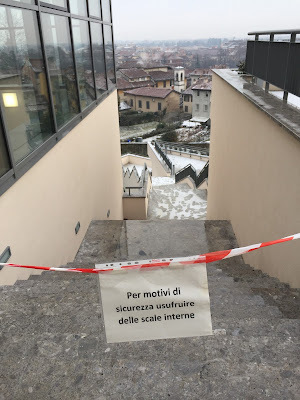 While motivi di sicurezza was “safety reasons” above, ragioni di sicurezza here becomes “security reasons”. 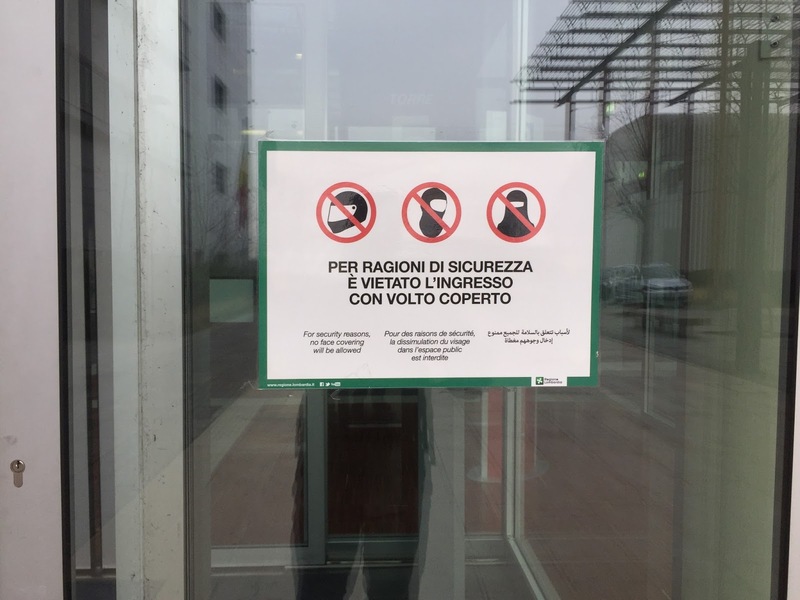 This sign was seen at the entrance to Ospedale Papa Giovanni XXIII.